Washington Apple Pi Summer Picnic 2006! The third annual Washington Apple Pi Picnic was held on Saturday, July 15 at the home of Pat and Ron Fauquet in Fairfax Station, Virginia. About 40 people showed up thanks to lots of advance reminders and some very accurate driving directions. There were many familiar faces and several newcomers, along with at least two non-member guests added to the mix. The Pi provided hot dogs, hamburgers and drinks, while most of those attending provided a side dish or a dessert to share. There was plenty of food to go around and many delicious choices. Ron was chef superb, cooking at his large gas grill out on the deck. Some of the crowd gathered out there to watch, chat and eat. Pat was well prepared for the day by setting up several large tables inside their home where picnickers could escape the heat. The wonderful open floor plan of the house made it easy for people to wander around and visit. The guest of honor was Bob LeVitus, a.k.a. Dr. Mac. He is relaxed and fun to be around. After lunch he gave an informal presentation on Being a Power User with OS X and answered lots of questions. The raffle prizes were three copies of Bob’s book, Mac OS X Tiger for Dummies. With the help of the Fauquet granddaughters (Katie, Hannah and Courtney) who picked the random winning numbers, Nancy Little, Helen Barsalou and Gordon Nord walked away with a book each. As a bonus, they had their new books autographed by Dr. Mac. A fourth door prize was a license key to WebnoteHappy, which is a Web page bookmark manager. It is the creation of one of the Pi’s programming gurus, Luis de la Rosa, and Graham Young was the lucky recipient of this nice software prize. Dr. Mac left for a scheduled scheduled stop at the Tyson’s Corner Apple Store for a Garage Band demonstration. Some of the picnickers followed him there and then went on to dinner with Bob, Pat and Ron at Legal Seafood. It was a wonderful day full of fun, education and friendship. 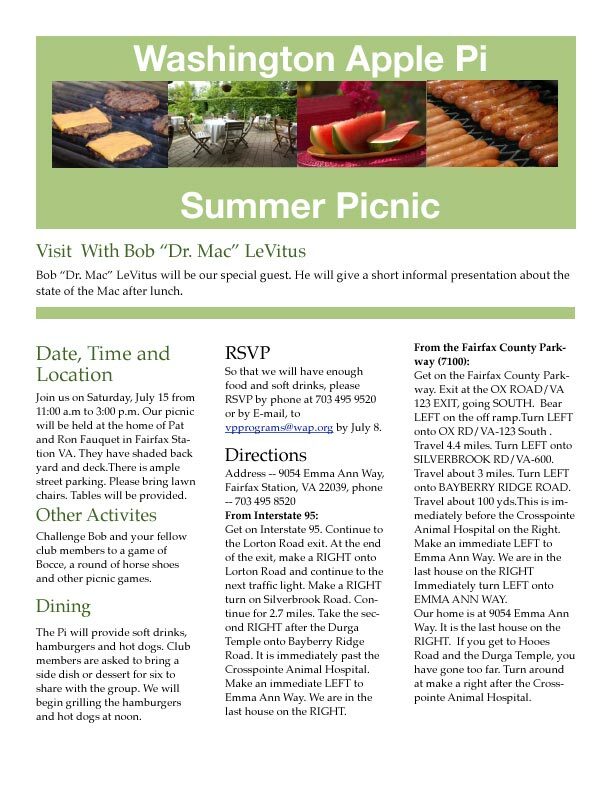 Picnic announcement brochure (in JPEG or PDF format).